Been very happy with our broadband connection with BT for well over a month now using a BT Hub 4A router, when all of a sudden on 25th of September about 23:00 we lost our broadband connection where it would go up and down every few minutes. What I did notice was we never lost connection to our exchange, but we did loose our WAN connection. So I phoned BT up where I was in a queue for about an hour, so I guess loads of people was having broadband issues. When I finally got through I was asked to run two of their tests where it would just error out due to loss of connection to the WAN. Also what confused the BT Guy on the phone was he could talk to our router fine and never lost any connection, so he I think he called it elevated or escalated up one level and was called by them the next day, where she had similar issues, but by then it seemed to of sorted it self out until that night at about 19:00 to 23:00 again where it would go up and down for several hours and then settle down. And we didn't even loose sync connection to the exchange. We would have this happen every night and then it would be fine for a few days then start again. Which says that the BT Retail server has on issue, and that they would update that once they have more info and that was about 2 weeks ago. The two last images from BT's Tests seem fine to me and seems to stay the same. I have seen a lot of areas that have lost BB with BT due to 3rd party issues and cable theft etc., was wondering if that was the cause for our loss of connection. I also did some speed tests on here where you can see its all over the place on minute and then fine the next and then back all over the place. Your test shows a variable streaming result. Oops, might need to be moved into "Technical Issues"
Moe likely to get an answer here . Sorry, at the moment I can't help myself. "Angels can fly because they can take themselves lightly." - G K Chesterton. Does the log, where you got that connection information, say anything about Connection, WAN, LCP, IPCP or CHAPS Up or Down at the times in question? Important to know if the connection from router to BT is dropping or if it is the device to the router. I have a homehub 5 and most evenings all the devices on the network would lose connection to it. They would connect again after about a minute and then 10 minutes later it would drop again. It could do it a number of times in an evening or sometimes not at all. It always coincided with the BT systems doing a remote login to the router. In the end I swapped it with a Billion router and haven't seen any of these issues since. Yep, loads of them all started happening around the 25 of September. This was what I saved due to the HH4 only has a small buffer for the logs and it filled that up. When it gets loads of those going on for like 10 to 20 mins the router's Web UI becomes all sluggish and takes upto 5 seconds to display its pages and not and then it has even re-booted due to possibly the Watch Dog inside the router rebooting it which has happened twice since the 25th. 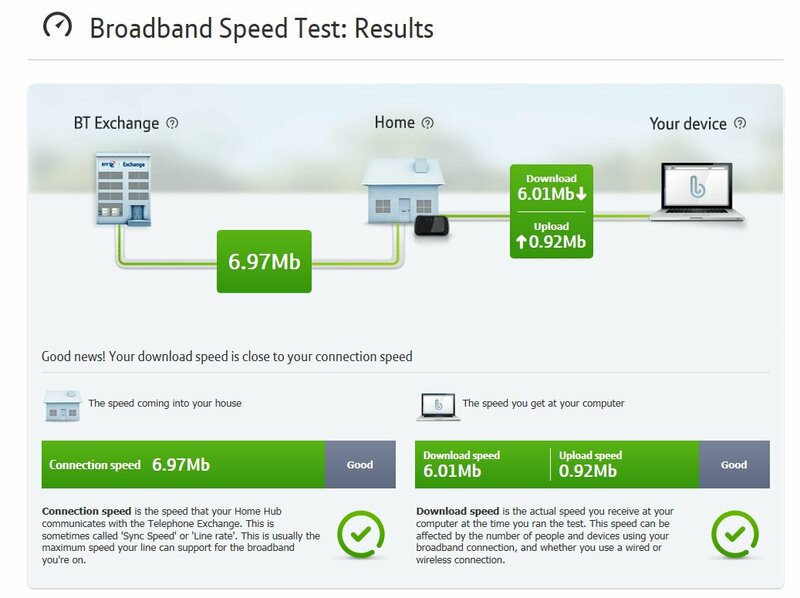 And this morning I just tried the TBB Speedtest and got a really rubbish speed that was all over the place. I have tried a TP-LINK TD-8817 Router to see the Line Status like attenuation etc, but that even failed to connect to the WAN, it synced up fine, but was trying to give us a SNR of 0.1dB and there is nothing wrong with the router due to it works fine on our other line and it did use to work on this line where it would sync up as +7Mb. Anyhow I even went and brought a brand new router that supports ADSL2+ as well as vDSL ready for when OR gets off their backside to install our Fibre that's been put on hold (mid install) since 2011. Anyway I brought a Fritz!Box 3390 which seems to work at first but nothing I do in the line settings helps I even turned it all down to Maximum stability which gave up a couple of meg sync speed and we still got those errors, granted they was less, but no matter what I did it was getting slower and slower, I got rather paranoid and set back up the HH4 which gave us our max speed again but with all the up down up down palaver. Haven't a clue what the 2.86331e+06 is for the exchange. 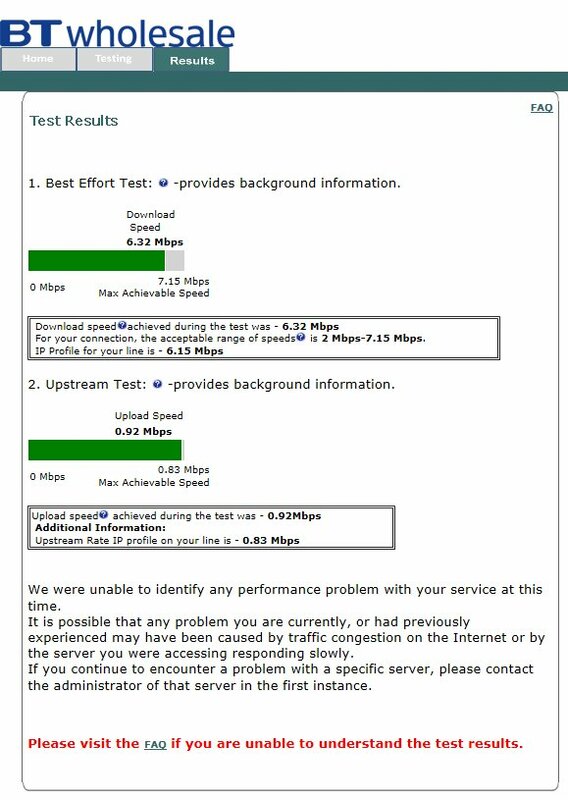 I know our line can handle 5.5Mb due to that is what we was getting very easy with no drops with our last provider before the move to BT. One thing I did know is when it was getting that bad it was moving us all over the place between ADSL2+, ADSL2 and ADSL Modulation types. And as you can see in the WAN logs that it has lost connection to BT yet hasn't from the exchange, pointing to BT having an internal fault and not our line. The strange thing is I can run both of BT and the Wholesale tests only on the HH4 and other routers fail the test. But with the HH4 connected both tests when run multiple times (with 10 mins gap for the BTW tests) are fine as you can see in my first post. And like I said this just started to happen on the 25th of September, we was all fine day and night even with a slightly higher speed no issues what's so ever. 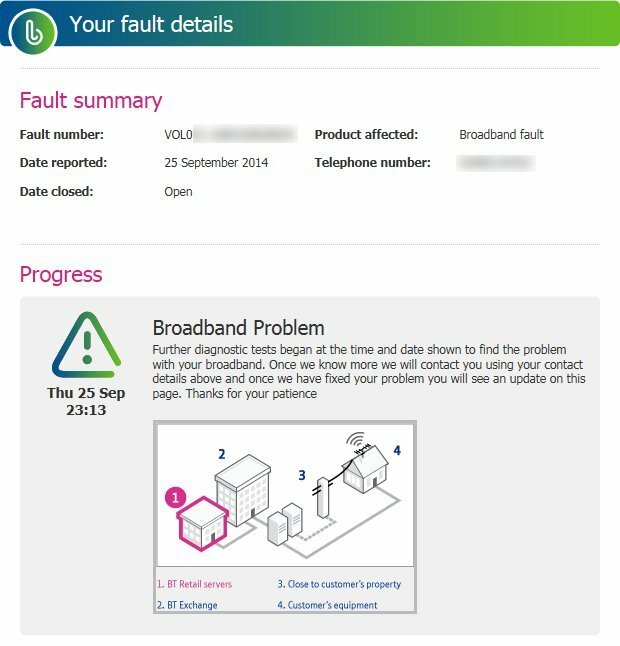 Further diagnostic tests began at the time and date shown to find the problem with your broadband. Once we know more we will contact you using your contact details above and once we have fixed your problem you will see an update on this page. Thanks for your patience. Oh and the section that is highlighted with the pinkish border is 1: BT Retail Servers which hasn't changed since the 25th. Just did another speedtest on here and its still all over the place and nobody else is using the connection due to I disconnected it along with myself from our LAN. See it will be like this for X amount of time and then just go all over the place. Also the funny thing is I can reboot the router it will re-sync and give me about the same speed and it will be fine for a while and then go bad again. The only thing that has changed with our broadband is the Line card in the Exchange, the Provider and the HH4. I don't think its the HH4 due to I have worse issues with other routers than I do with the HH4 so its not that. So I can only put it either down to the Line card in the exchange or an internal issue with BT. I even tried it in our Master Test Socket with a micro filter (took forever to do with a back injury, why they are fitted that low I don't know) in it for a couple of hours and no change what so ever speed up and down all over the place line the connection and the line attenuation etc. stats were exactly the same, so its not an internal wiring issue. Yeah, seems very similar, what confused me was I can connect and sync fine from our HH4 router to the exchange every time, even when the WAN connection is lost or when the speed just drops like that, so it shouldn't be our line and the issue must be internal to BT's network. The thing is that it doesn't always happen, it could be fine for several hours and then goes belly up, so we can never ask for an engineer visit due to it might be fine at that time, and then be given bill to pay for them coming out. Can you send me over your details and I will take a look into this for you.